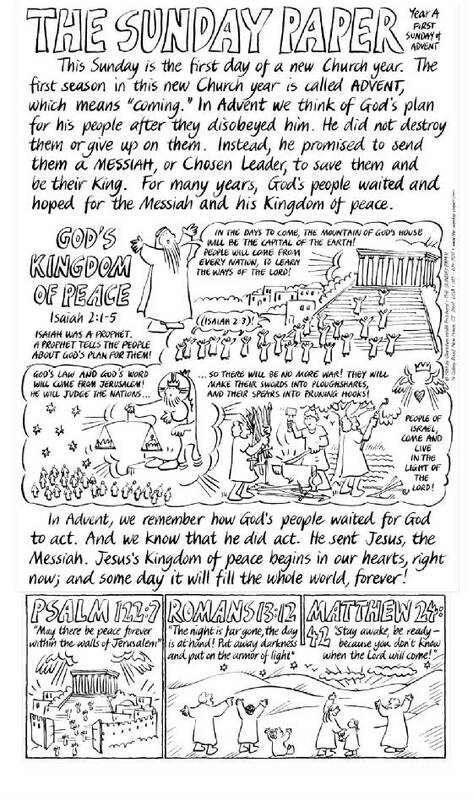 The original SUNDAY PAPER appeals to intermediate through junior high, and presents one lesson (usually the Gospel) as a two-line cartoon; the other readings, and the Psalm, are presented as single vignettes. The lessons are tied together with a short commentary. THE SUNDAY PAPER provides both Track 1 and Track 2 of the Revised Common Lectionary (as used by the Episcopal Church USA) to all subscribers, allowing you to mix and match depending on which lessons are read in church on a given Sunday. 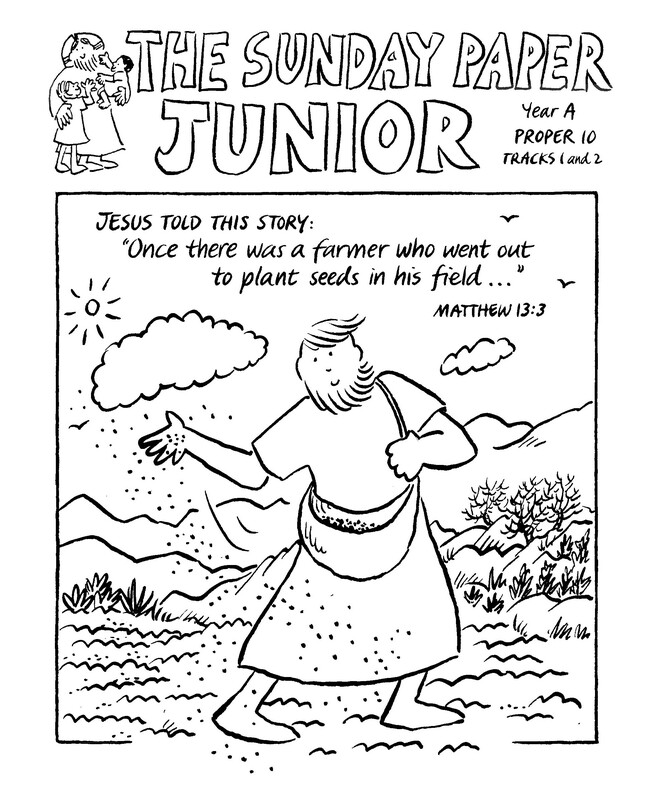 THE SUNDAY PAPER JUNIOR is aimed at younger children (preschool through grade 3 or 4), and also covers both tracks of the Revised Common Lectionary. The SUNDAY PAPER JUNIOR features one lesson only, usually the Gospel. THE SUNDAY PAPER JUNIOR offers big, bold artwork, a simple story line, an activity page designed to stir children's imaginations and spirituality and that requires pencil or crayons only (no glue or scissors) and does not involve word games or other literacy-based activities. THE SUNDAY PAPER JUNIOR can be used in church, nursery, or classroom. Click below to download and print a full-size issue of The Sunday Paper or The Sunday Paper Junior, in .pdf form. To format them correctly, use legal-size paper (8 1/2 by 14 inches) and set your Page Scaling preference (on the Adobe Print menu) to "None." Subscribers to THE SUNDAY PAPER or THE SUNDAY PAPER JUNIOR receive a .pdf file for each Sunday's issue, which may be printed out and duplicated in quantities needed for local use. Sunday issues are supplied in batches by church seasons, one to two weeks before the first Sunday in the batch. You may subscribe year-round or for portions of the year. Materials are sent as .pdf files via email. We no longer distribute paper copies by mail. The price for a full year of either THE SUNDAY PAPER or THE SUNDAY PAPER JUNIOR is $76.00. The price for a full year of both ordered together, is $120.00. The price for an academic year of either edition (September through Pentecost Sunday) is $63.00; for both together, $96.00. Trial subscriptions for one “season” (6 to 8 weeks) of either THE SUNDAY PAPER or THE SUNDAY PAPER JUNIOR are available for $22.00, or both togeether for $32.00. Or you may put together a combination of seasons, such as the two summer seasons, or Fall through Advent/Christmas, or Epiphany through Eastertide, to match your particular needs or your budgetary calendar. Per-season prices for two or more seasons for either THE SUNDAY PAPER or THE SUNDAY PAPER JUNIOR are $12.00 per 6-to-8-week season; for both SUNDAY PAPER and JUNIOR together, $18.00 per season . For further details, see the Order Forms page. Occasionally, you may change your mind and decide The Sunday Paper is not for you. Our cancellation policy is to charge for actual installments sent to date, at the per-season rate, plus an administrative charge of $10.00. Our prices are, in effect, a licensing fee, so this policy applies even if you do not open or download the materials, as long as you did in fact order them. The Sunday Paper’s Editorial Page is an article, meditation, or resource review accompanying each seasonal transmission during the school year. The Editorial went online in 2016, via The Sunday Paper’s blog, thesundaypaperblog.wordpress.com, allowing comments, color illustration, links, etc. However, the Editorial itself continues to be attached to each transmission as a .pdf document.